Puncher is one of the most useful bento tools and is durable in making bento. It comes with many shapes, sizes and colors. 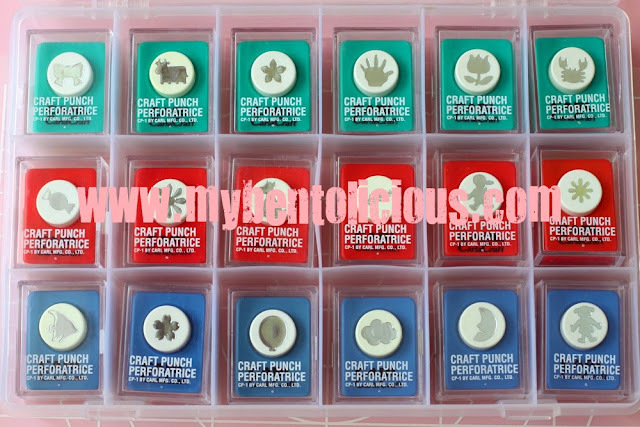 I love to collect puncher not for handicraft purpose but for my bento hobby. My husband just got surprised with the number of punchers I have now when I took them out to shoot the pictures for this posting. Psssttt ... a lot more punchers not shown in the pictures hahaha ... bento addict!! I just want to share what I do with my all punchers. I put them in the box with divider and store them in a dry place to avoid rusting and always making sure to clean them after used. My favorite puncher is from Carla Craft. It comes with very good box / puncher cup / individual box (as shown in the pictures below); and not to mention a very good quality too. The other brands of puncher might come with box or no box at all. You can find some boxes to store them. I found the divider box from an art & craft store that actually is for storing beads but since the size is perfect for the puncher, I bought some, very convenience to store all my punchers and keep them organize. Some tips that I've got from the art & craft store that sell the punchers : To sharpen the puncher, we can punch through a couple of layers of aluminum foil (shown in the picture below). I don't know if this actually working or not because I haven't got any dull punchers so far. But since this is recommended, I think is worth to try. Don't assume that every new puncher will come in good and sharp condition. 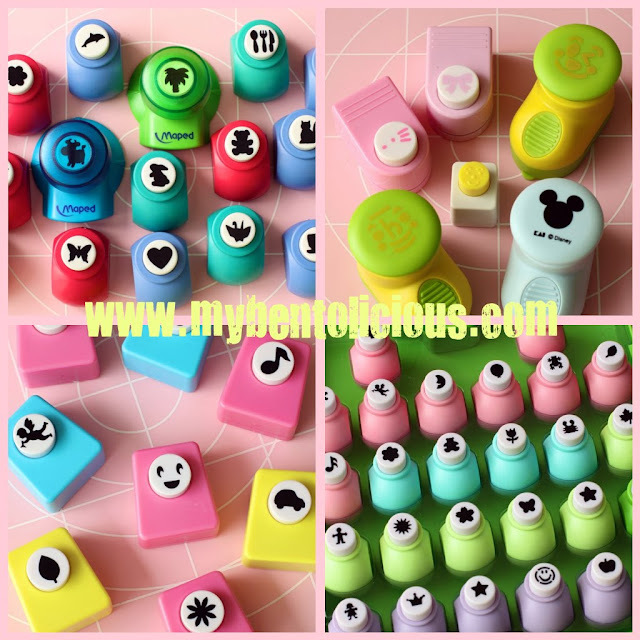 Recently, I just bought my new face puncher (light green-light yellow-pink as shown at the top picture) but some of the face part like mouth on light green and pink punchers did not punch perfectly. I have tried everything to get a perfect cut but no good result. Anyone have this problem too? I don't know what exactly happened to these new punchers because all my other punchers working very well. * Wet a kitchen cloth with light soap and water then wipes the puncher. * After that, wipes the puncher again with wet kitchen cloth without light soap, only clean water. * Dry the puncher with hair dryer. It is very important to keep the puncher dry so it will not get rusty and dull quickly. * Double check whether the puncher is really dry or not using kitchen tissue. what a collection!!!!! tks for the tips too. yeah, need those boxes to keep them otherwise they'll end up everywhere! WOW! So many punchers...how many you have? The smiling faces are so cute! Thank you for the tips of cleaning:) Recently I just bought 4 punchers. @javapot : Yep, otherwise the punchers will be everywhere. Thanks Javapot! Nice collection....You have some really great bento gear! Wow wow that is a lot of adorable punchers!!! I just love the cute faces ones! Wow you are a great bento tool expert! I think aluminum foil works well since scissor also get sharp with it. I have no puncher but it's fun. I'd love some one! Great tutorial and those are awesome punches!!! LOL, I thought I had a lot! :D Lia, you are my bento hero! That's an amazing collection. I've only got a few for my nori (bentos) and another handful for my scrapbooking. 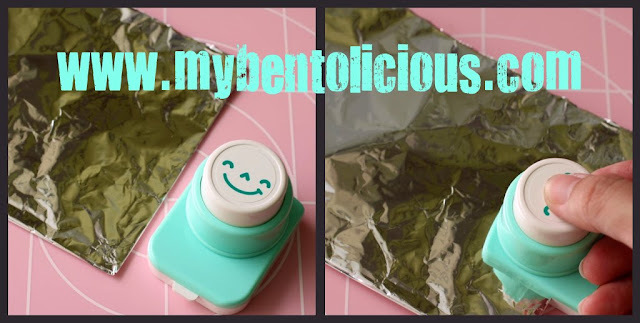 You are not only an amazing bentoist, but you are the queen of bento tips and help. WOW!!! This is an amazing collections of punchers! 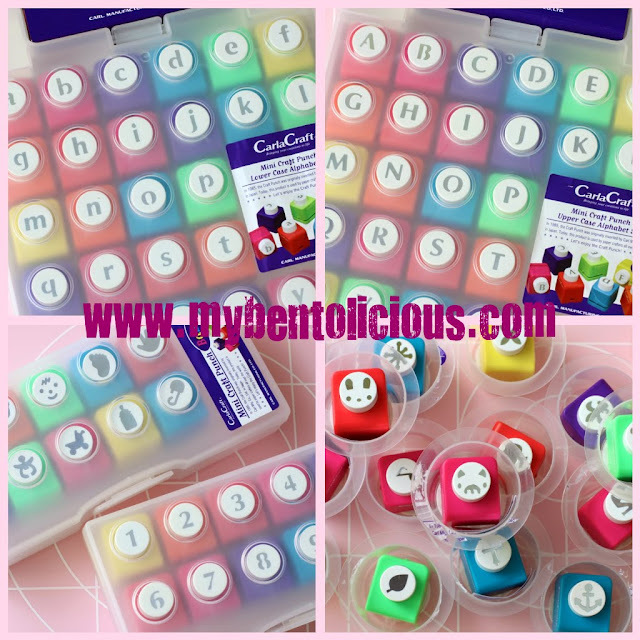 Lia, I should go and find the alphabet punchers, that would make my life easier when I made spelling bento! I didn't know that we can get a set, and they are from Carla Craft right? I like Carla Craft's quality. Thanks for sharing that! Thank you for bento tips that u share with us. @Kids Dream Work : Yes, you can find it from your Art & Craft store. It will be great for your spelling bento, save so much work in cutting the nori ;) Thanks for the comment! thanks for the tips! I bought some cheapo punchers and they were leaving some little metal shards so I stopped using them. I will try the foil to sharpen and remove the little shards. And WOW, quite a collection! Wow, I always learn something from your blog Lia, and look forward to your pictures of your amazing collections!! Better than any store, you have the whole selection of every punch ever made! I love Carla craft ones too, they are soo mini and cute!! But I also like the one that punches eyelashes. They are shaped just like sesame seeds. I wish I took that good care of mine... sadly I usually punch, then put away (oops!) I better shape up before the bento teacher scolds me!! Thanks for the tips, it's really helpful. Wau... moving house.... congrates! Ok ok, don't forget to share the pictures. I have those face punchers too and like you said, they don't cut out completely. Will try your tip and see if they will get sharpen after that. Thanks! I'm so envious of your collection! 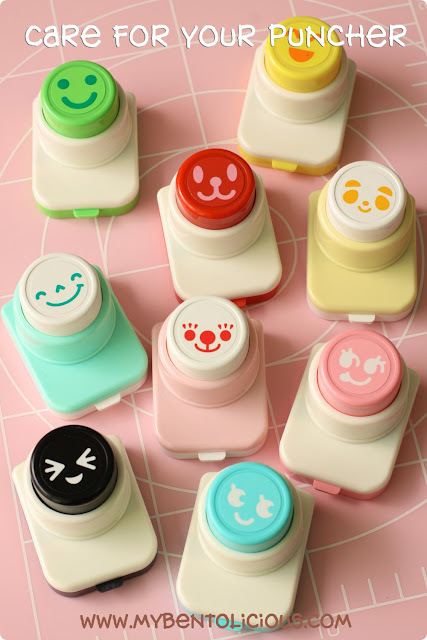 Inge, you can get it on some online store at Multiply ... try to search it on japanesehouse or you can buy from Malaysia BENTOCRAFT. Thanks a lot! Lia..seneng banget liat koleksinya..salam kenal ya..saya lagi belajar bento nih...kalo di jakarta beli pernak pernik bento (termasuk puncher) yang lumayam lengkap di mana ya..
@Meitawids : Thanks a lot! Di Jakarta adanya cuman di Daiso dan harus hunting dan browsing di online store. I ve read your sharing on the care of punchers. so means only can be wipe, not recommended to directly ''bath'' it with water rite?